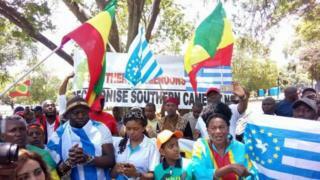 Interim Government of di Federal Republic of Ambazonia, wey bi Cameroon secessionist group, don choose new leader to take replace Sisiku Ayuk Tabe, according to tori from Cameroon Intelligence Report. Di spokesperson for di South Cameroon group say dia new president Sacko Ikome "consider say di journey to Buea dey urgent." Dis one dey come after di deadline wey di Cameroon secessionist carry give government to show proof say dia leaders dey alive don expire today, without any response from Yaoundé. Cameroon secessionist leader dem dey Yaoundé? Di new leader wey dem elect go also get new people to take replace di oda top officials wey dem arrest with President Sisiku Ayuk Tabe for Abuja, Nigeria when President Buhari government hand dem over to Cameroon. Di former leader and senior figures of di secessionist group dey di Secretariat for Defense for Yaoundé, on top charges of rebellion and sedition. Ebola virus don reach Cameroon?